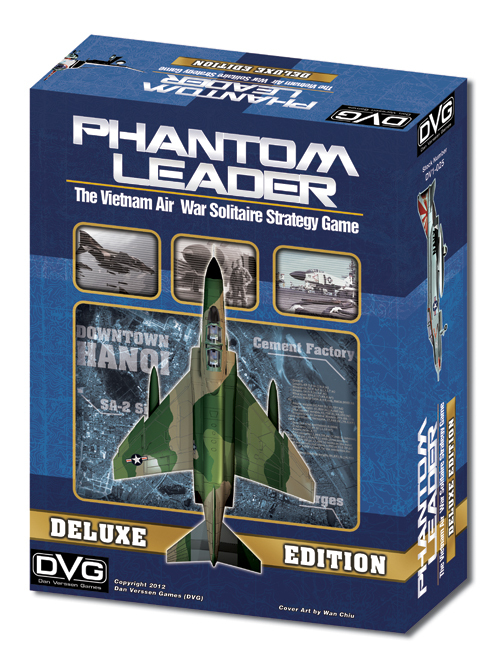 Phantom Leader Deluxe from Dan Verssen Games is a solitaire game set during the Vietnam War between 1965 and 1972. You will be commanding US Air Force and US Naval pilots who each have unique skills and their planes each have different weapons to attack their targets. As pilots become fatigued and stressed, their accuracy will decline and could become unfit to fly. If your pilots succeed, they will earn experience so that they may “level-up” to higher skill levels and awarded victory points toward various campaigns. First, you will select a campaign card, each with its own special rules and choose either a short, medium or long campaign. The sequence of play is broken down into five phases. First is the Pre-Flight Phase. You’ll draw target cards and select the one you wish attack based on your politics counter on your campaign sheet. Every target has a political value assigned to it. The higher the value, the less choices of targets will you have later as you choose from less politically sensitive targets. The harder a target is to destroy the better defended it is and the more victory points it will be worth. 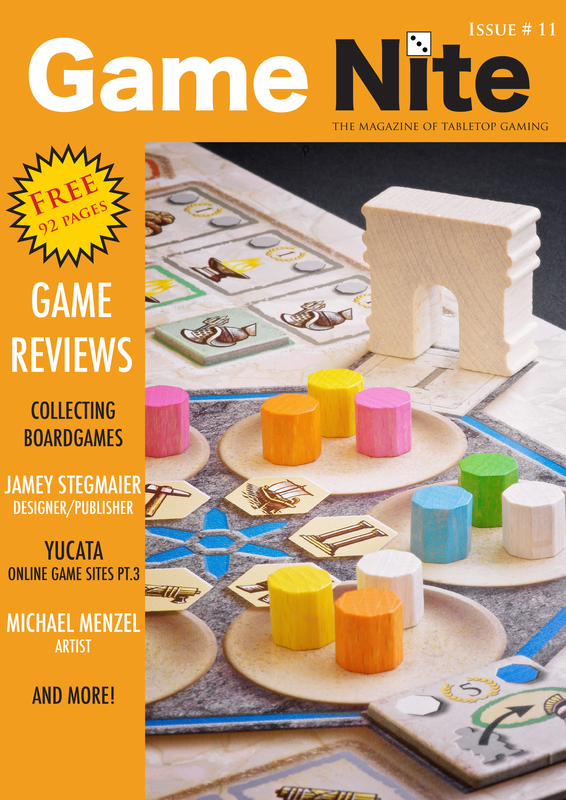 This game is first and foremost a planning game. Each aircraft has specific types and amounts of weapons it may carry. Also, your distance to the target will affect this. You will spend a majority of your time playing this game in this Pre-Flight phase while you study the target area determining what munitions are the best choice. These are agonizing decisions but it is a good agonizing as this is where the meat of the game lies. Next is the Target-Bound Flight Phase. 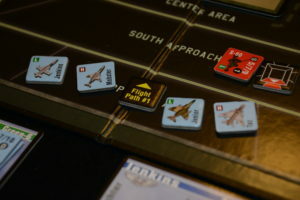 After you have resolved an event card, you place your aircraft in a pre-approach area on the edge of the tactical display and their exit path markers. Aircraft must exit the tactical display at these or their adjacent areas. Finally, enemy “bandits” are placed and the Over-Target Phase begins. You’ll need to destroy the target for the most victory points while defending yourself against ground and air defenders. But you can’t loiter over the target for long as you only have five turns to get in and exit the map before you run out of time. Pilots are fast or slow. Fast pilots get to attack first, followed by enemy sites and bandits and lastly your slow pilots. Then, all aircraft including bandits move and may adjust their altitude. Weapons counters on your aircraft are expended to attack sites, bandits and ultimately the main target in the center. 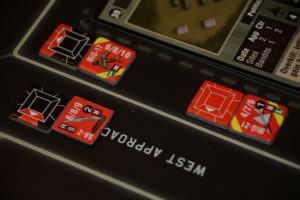 Combat results are based on die rolls as indicated on the weapons counters. Some weapons can only be used air-to-air, others at low altitude, and others are ranged. While this is all an oversimplification of game play, it’s really not that difficult, and is easy to master after a mission or two. As pilots gain stress through evading attacks or taking damage from enemy units, they can become shaken which adversely affect their die rolls and possibly make them “unfit” to fly which would force them to bug out home! Until unfit pilots are rested and regain some of their cool, they cannot fly another mission. Once you have completed the Over Target Phase, the player draws an event card and resolve the Home-Bound Phase event. Finally, you move on to the last phase called Debriefing. This is essentially, a records keeping phase where you record victory points, pilot stress, pilot recovery and experience on your player log sheet. 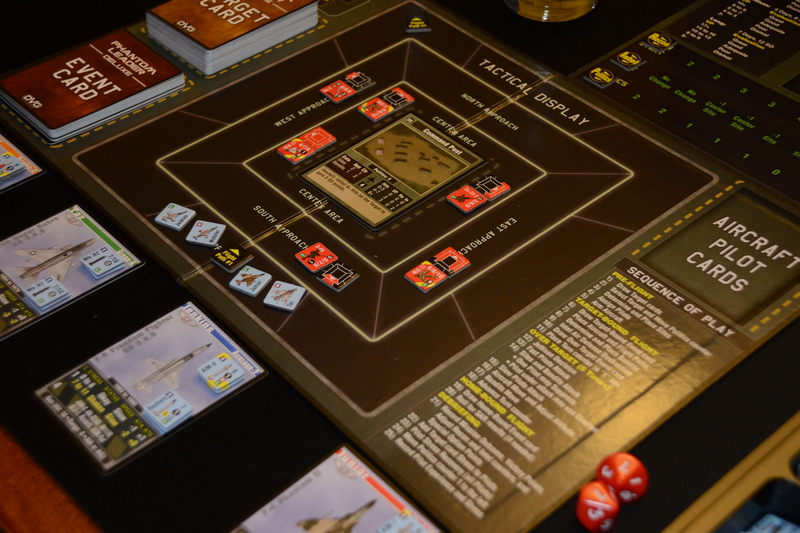 You sit in command of your Naval or Air Force squadrons trying to best figure out how to efficiently take out the target as well as defending yourself from enemy bandits and ground sites. With repeated plays, you will be more accustom to the types of weapons and what targets they are best suited for. There is a lot luck involved with regard to dice rolls. You think you have an enemy in your sights whether it’s a ground-based missile launcher or a MiG-17 trying to blow you out of the sky, you roll your dice…a hit! The target is destroyed! That level of excitement and the “edge-of-your-seat” stress in the Over Target Phase is thrilling and fast playing but it can also be frustrating if you get some bad rolls. The “leader” system is an easy system to understand and play. DVG has other games in the series if perhaps you are more interested in tanks, submarines, helicopters or A-10 Warthogs! 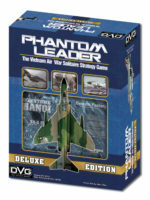 Phantom Leader Deluxe is the flagship of the series and considered by many solo gamers as the best. Good luck on your missions and may all your pilots get home safely.